The vast majority of class A, rhodopsin-like G protein-coupled receptors (GPCRs) possess a pair of hydrophobic residues (highlighted) in the second intracellular loop, downstream of the highly continued firming the functionality of this construct. When similar experiments were performed with a version of this fusion protein that also incorporated a Gly203Ala mutation in the G protein, DADLE did not enhance incorporation of the nucleotide. This was also true for a version of the fusion that incorporated Val150Glu and Val154Asp mutations into the second intracellular loop of the GPCR element but that was wild-type for Gai1, other than the pertussis toxin-resistant Cys351Ile mutation. However, when Val150Glu,Val154Asp DOP-Cys351IleGai1 was co-expressed with DOP-Gly203Ala,Cys351IleGai1 membranes prepared after treatment with pertussis toxin and containing 15 fmol of DOP-opioid receptor binding sites displayed marked reconstitution of [35S]GTPyS binding in response to DADLE (Fig. 1). Assuming that the intracellular loop 2 mutations do not interfere with DOP-DOP interactions, that GPCRs function as dimers, that dimers bind two ligands, and that Val150Glu,Val154Asp DOP-Cys351IleGai1 and DOP-Gly203Ala,Cys351IleGai1 express to equal extents in the cotransfections, simple arithmetic defines that the heterodimer (containing one copy of each of Val150Glu,Val154Asp DOP-Cys351IleGai1 and DOP-Gly203Ala,Cys351IleGai1) should represent only 50% of the ligand-binding sites. Of the other 50%, 25% would be expected to be Val150Glu,Val154Asp DOP-Cys351IleGai1 homodimers, and 25% would be expected to be DOP-Gly203Ala,Cys351IleGai1 homodimers. As demonstrated earlier, neither the Val150Glu,Val154Asp DOP-Cys351IleGai1 nor the DOP-Gly203Ala,Cys351IleGai1 homodimers bind [35S]GTPyS in response to agonists. Therefore, conceptually, following co-expression, membranes containing 30 fmol of antagonist binding sites could be anticipated to bind the same level of [35S]GTPyS in response to agonist as membranes expressing 15 fmol of the DOP-Cys351Ile Gai1 fusion protein. Reconstitution was not this effective (Fig. 1). This may imply that the quaternary structure of the GPCR-G protein fusion is a higher order oligomer rather than a dimer or that there is a complex mixture of species that may also include monomers. Further analyses are required to test these ideas. Table 2 (From opposite page) conserved 'DRY' domain at the bottom of transmembrane region III. In the examples we tested, alteration of one or both of these to acidic residues resulted in forms of the GPCR that are unable to activate G protein. This provides a potentially generic means to form an inactive GPCR-G protein fusion protein. Such mutations do not affect the binding of antagonist ligands. The effect on the binding of agonist ligands is more complex and generally reflects whether the GPCR in question shows a significant alteration in agonist binding in response to addition of guanine nucleotides. For example, many Gq/Gjj-coupled GPCRs display only a marginal effect on agonist binding affinity; however, for Gs and Gi/Go-coupled receptors, this alteration in affinity can be substantial. Fig. 1. Functional complementation of agonist-mediated [35S]GTPyS binding by co-expression of pairs of inactive DOP-opioid receptor-Gai1 fusion proteins. A fusion protein was created between the human DOP-opioid receptor and a pertussis toxin-resistant Cys351Ile mutant of Gai1. Further modifications to this fusion introduced either Val150Glu,Val154Asp mutations into the receptor element or Gly203Ala into the G protein. Each of these three fusion proteins was transfected into HEK293 cells that were then treated with pertussis toxin to cause ADP-ribosylation of endogenously expressed forms of Gai/Gao. Expression levels of the fusion proteins were measured by the specific binding of the opioid receptor antagonist [3H]diprenorphine and membrane amounts containing 15 fmol of each fusion protein used in [35S]GTPyS binding studies, which were conducted in the absence or presence of the synthetic enkephalin DADLE (10 |M). At the termination of assay, samples were immunoprecipitated with an antiserum directed to the C-terminal decapeptide of Gai1 and were then counted. Equivalent studies were also performed on membranes of cells into which Val150Glu,Val154Asp DOP-opioid receptor-Cys351IleGai1 and DOP-opioid receptor-Gly203Ala,Cys351IleGai1 were co-expressed. Co-expression reconstituted DADLE-stimulated [35S]GTPyS binding, but this was not produced when membrane preparations individually expressing either Val150Glu,Val154Asp DOP-opioid receptor-Cys351IleGai1 or DOP-opioid receptor-Gly203Ala,Cys351IleGai1 were mixed. 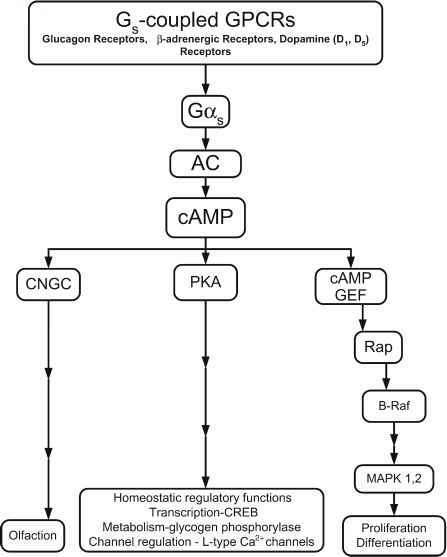 Importantly, however, co-expression is required to reconstitute function. Membranes prepared from cells each expressing one of the inactive fusion constructs did not allow agonist-stimulated binding of [35S]GTPyS when mixed. Equivalent fusion constructs incorporating the ^-opioid peptide (MOP)-opioid receptor have similar characteristics, and reconstitution of agonist function is again achieved following co-expression of the pair of individually inactive fusion constructs. Co-expression of one inactive fusion containing the MOP-opioid receptor, with the partner containing the DOP-opioid receptor, also results in reconstitution of function and is consistent with the formation of a MOP-DOP heterodimer (54,55). Fig. 2. Detection of a1b-adrenoceptor dimerization by functional complementation of a pair of inactive a1b-adrenoceptor-Ga11 fusion proteins using single-cell Ca2+ imaging studies. A fusion protein was constructed between the hamster a1b-adrenoceptor and Ga11. This construct was transfected into a mouse embryo fibroblast cell line (EF88 cells) derived from a double Gaq/Ga11 knockout mouse along with green fluorescent protein (GFP). 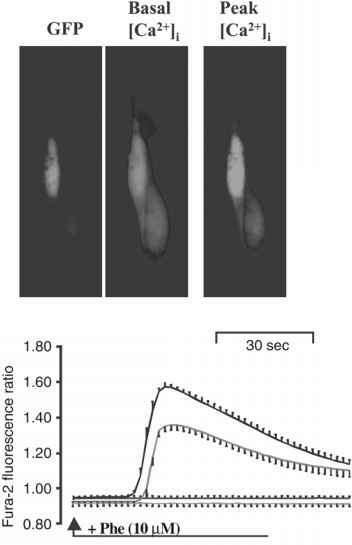 Imaging of these cells (top panel left) shows only a single positive cell in the field, and this was the only cell that responded to phenylephrine (basal vs peak [Ca2+]). Because these cells do not express any G protein able to induce Ca2+ signaling, these data demonstrate the functionality of dimerization of the a1b-adrenoceptor bringing the wild-type G protein and wild-type receptor into contact (41). Similar data have been obtained for fusion proteins between the histamine H1 receptor and Ga11. As mentioned earlier, the binding affinity of both antagonist and agonist ligands for the a1b-adrenoceptor-Ga11 fusion protein was unaffected by introduction of the Leu151Asp mutation that blocked agonist activation. This may seem rather surprising, because the affinity of agonist ligands is often modulated by the interaction status of GPCR and G protein, and such effects have been observed for other GPCR-G protein fusions (56). However, gua-nine nucleotide-induced shifts in agonist affinity are well established to be very small for a1-adrenoceptors. Significant alterations in agonist affinity might be observed with the introduction of equivalent mutations in other GPCR-G protein fusions. Fig. 2 (From opposite page) the fusion protein. The detailed time-course of [Ca2+] regulation in response to phenylephrine is shown in the bottom panel (top-most line). The fusion was modified to introduce a Leu151Asp mutation into the receptor element (bottom-most line) or a Gly208Ala mutation into the G protein (second line from bottom). When expressed in EF88 cells, neither of these mutants responded to phenylephrine; however, agonist-mediated signaling was reconstituted when they were co-expressed (second line from top). [Ca2+]i in response to phenylephrine (41). This was also the case for Leu151Aspa1b-adrenoceptor-Ga11. 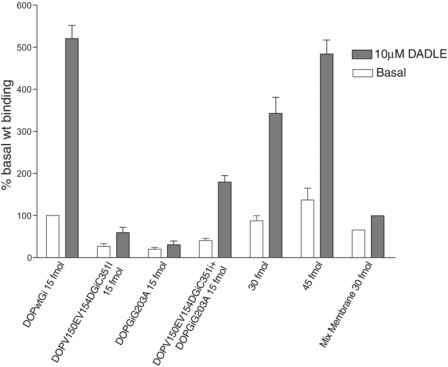 Similarly to the membrane-based assays, co-expression of Leu151Aspa1b-adrenoceptor-Ga11 and a1b-adrenoceptor-Gly208AlaGa1111 resulted in a restoration of phenylephrine-mediated elevation of [Ca2+]i (Fig. 2). Because there are no appropriate endogenous G proteins in these cells, such data require interactions between the complementary fusions. Similar results were obtained when equivalent fusion proteins that incorporated the histamine H1 receptor rather than the a1b-adrenoceptor were used (41). When Leu151Aspa1b-adrenoceptor-Ga11 and histamine H1-Gly208AlaGa11 were co-expressed, histamine, but not phenylephrine, was able to elevate [Ca2+]i. The reverse was true when a1b-adrenoceptor-Gly208AlaGa11 was co-expressed with Leu133Asp histamine H1-Ga11 (41). A weakness of single-cell imaging studies is the impossibility of monitoring expression levels of each construct. However, when the wild-type histamine H1 receptor-Ga11 fusion was co-expressed with the isolated Leu151Aspa1b-adrenoceptor, the capacity of histamine to elevate [Ca2+]i was reduced. Although these studies are more difficult to interpret than the parallel experiments performed in membranes of HEK293 cells (in which the expression levels of both the histamine H1 receptor-Ga11 fusion and Leu151Aspa1b-adrenoceptor could be measured directly by [3H]ligand-bind-ing studies; see Subheading 3.2. ), their results are consistent with the Leu151Aspa1b-adrenoceptor forming a nonfunctional heterodimer with the histamine H1 receptor-Ga11 fusion protein and thus reducing levels of functional histamine H1 receptor-Ga11/histamine H1 receptor-Ga11 homodimer. This type of strategy should be generally applicable for GPCRs that couple to the Ca2+ mobilizing G proteins Gq and G11, and may be appropriate to measure the relative interaction affinities among GPCRs.